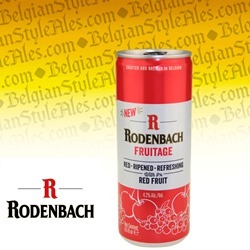 Fruitage from Rodenbach (ABV 4.2%) is a blend of 25% traditionally aged Rodenbach ale (2-year matured beer from standing oak foeders) with 75% 'young' Rodenbach ale, along with cherry and elderberry juice for an innovative take on classic Flanders Red Ale. Pouring deep ruby with a pink head, it is redolent of juicy, tart red fruit. Taste is jammy but dry, with hints of oak and a nice acidic zing. Light bodied and lower in alcohol, and with generous carbonation, it's perfect for easy drinking and can be enjoyed year-round. 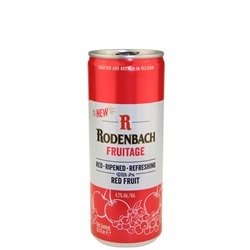 Rudi Ghequire, master brewer of Rodenbach says, "Fruitage is a light and refreshing beverage that is full of flavor, perfectly balanced, and complements a variety of foods and occasions." The Rodenbach Brewery was founded in 1836 by Pedro Rodenbach and his wife, Regina Wauters, in Roeselare, a town in the West Flanders region of Belgium. Their grandson Eugene traveled to England to learn from master-brewers of porter the principles of maturing beer in oak casks (or foeders) as well as the process of properly blending the results. He returned to Roeselare and created masterful sour ales for which the family's brewery became famous. Today the Rodenbach Brewery, since 1998 a part of the Palm Brewery Corporation of craft brewers, produces award-winning sour ales for distribution worldwide.